Two of my great loves (aside from Bryan and Legos, that is) are: 1) books and 2) quirky art featuring whimsical animals (think Michael Sowa and Ed Heck). Combine the two, and I swoon. My friends and family members have figured this out, so, on gift-giving holidays, I usually get a gift or two that fits that bill, like the gorgeous (and out-of-print) miniature coffee-table book Sowa’s Ark . This year, for my birthday, I received one such gift from my stepsister: a very special copy of Wildwood , a book full of quirky art featuring whimsical animals, inscribed and signed by the author and illustrator. Happy birthday to me! 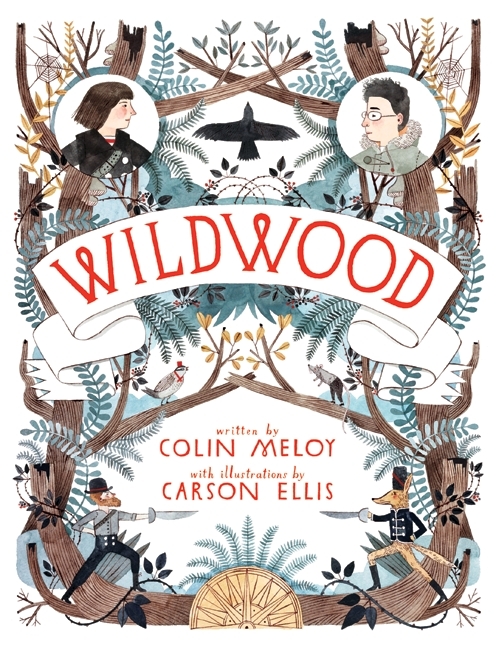 Wildwood is the first book by husband-and-wife duo Colin Meloy and Carson Ellis. You may not know this book, but you’re probably familiar with their work on other projects. 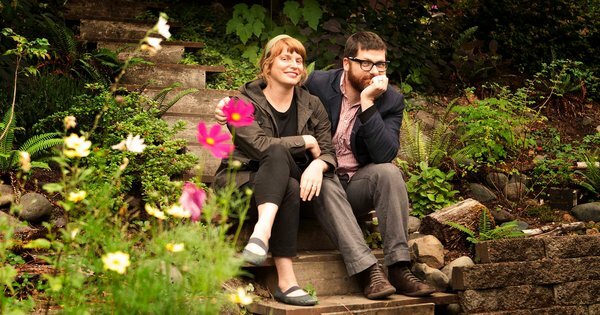 Author Meloy is the lead singer of The Decemberists. 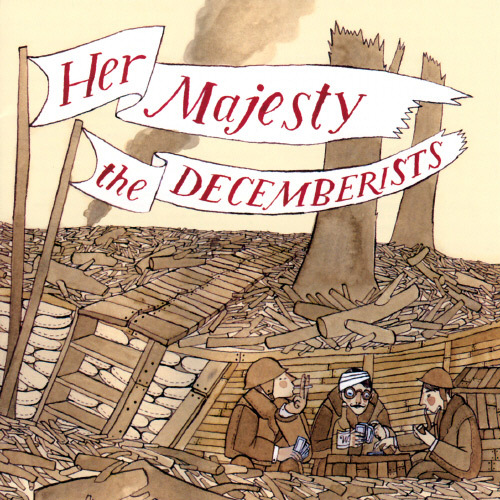 And illustrator Ellis is the artist responsible for The Decemberists’ gorgeous album covers (like Her Majesty, at left) and illustrations for books like Lemony Snickett’s The Composer Is Dead and Trenton Lee Stewart’s The Mysterious Benedict Society. Meloy and Ellis are clearly hipsters to the nth degree (if the folk singing and the quirky drawing didn’t give it away, then just have a look at them). And, as it turns out, they’ve got some hippie in them, too (I should have known–they live in Portland). So, it should come as no surprise that their book is a lovely hippie/hipster tale about how plants, animals, and people can happily coexist if we all respect each other. Wildwood’s protagonist is a precocious soon-to-be hipster seventh-grader named Prue. She lives in Portland (the book’s version of Portland, that is). She rides a one-speed bicycle with a red wagon attached to the back. She’s obsessed with The Sibley Guide to Birds and spends her free time doodling birds (replete with their Latin names). She practices her Pranayama breathing when times get tough. At the book’s beginning, Prue is babysitting her one-year-old brother, Mac, when a murder of crows abducts him from the playground. As Prue looks on, horrified, the crows make their way straight to the Impassable Wilderness with Mac clutched in their talons. Prue decides that, without telling her parents, she must venture into the Impassable Wildnerness to save Mac. As she is sneaking into the woods in the wee hours of the morning, she discovers that she has been trailed by her curious neighbor and classmate, Curtis. What follows is, basically, a hipster’s The Lion, the Witch and the Wardrobe . Instead of the wardrobe, there’s a magical bridge. Instead of Narnia, there’s Wildwood (the Impassable Wilderness to those on the inside). Instead of Jadis, The White Queen, there’s Alexandra, the Dowager Governess. Instead of hot drinks and Turkish delight, there’s blackberry wine and venison stew. Instead of anthropomorphic fauns and lions and such, there are anthropomorphic coyotes and birds and such. Prue and Curtis must endure being split up, kidnapped, fighting in battles, riding on eagles, and being imprisoned (among other adventures and challenges). But they are helped along the way by many unique people and animals, including Brendan, the Bandit King; Owl Rex, the Crown Prince of the Avian Principality; Ipheginia, the Elder Mystic; Septimus, the rat; and Sterling, the fox, Constable to the People’s Collective of the North Wood). Without question, the best part of this book is its illustrations. When my husband first saw me reading it, he said, “I love that cover. That is a book I would have wanted to read as a kid.” The inside covers of the book (front and back) are maps of The Wood, each chapter begins with a black-and-white drawing, and there are illustrations (some full-page, some just in a small corner, some running across the bottom of a page spread) appearing on every few pages. There are also six color plates interspersed throughout the book that are as beautiful and vibrant as the cover. The drawings are quirky and whimsical and bring the story to life. Without them, the book would have seemed much flatter. Unfortunately, like so many other middle-grade books, this book is too long (clocking in at nearly 550 pages). There are many times in the beginning, when the scene is being set, that it gets very draggy. You would think that, with over 500 pages, the characters would be well developed and complex. Not so. There is a lot of action, but not a lot of character depth or growth. On the flip side, it reads very quickly (this is helped along by those incredible illustrations). It’s full of excitement and adventure and anthropomorphic animals. And it’s set in Portland! Who doesn’t love Portland?? A man stepped forward from the throng on the opposing ridge. He wore a thick red beard and what looked to be the salvaged remnants of an officer’s coat, its red cloth and decorative braiding defaced by dirt and ash. Finger-wide streaks of paint scarred the cheeks of his weather-beaten face. He held a gnarled yew bow in his gloved hand, its sinewy string still quivering from the shot. A crown of ivy and salal was tangled in his matted, curly red hair, and his forehead was branded with a tattoo of some totemic aboriginal design. Advanced vocabulary in a middle-grade book makes for a perfect read-aloud selection, and, if I were still teaching, I would certainly read this aloud to my fifth graders. It is fun, fast-paced, full of magic, and has a good message. 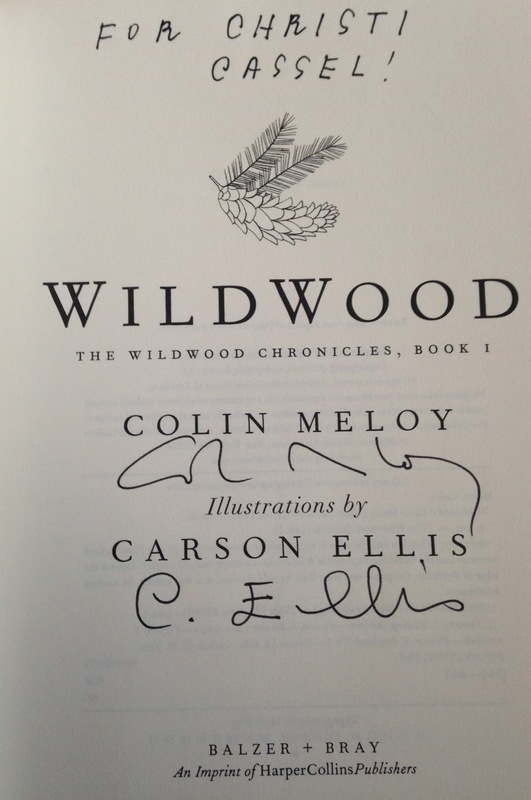 This entry was posted in Rating: 3.5/5 and tagged Book review, Book Reviews, Books, Carson Ellis, Colin Meloy, The Decemberists, Wildwood. Bookmark the permalink. Ha-how right you are 😜. Also perfect read-aloud for Aidan, now a fifth grader! !